Definitely worth checking out if you want sonic accuracy with a vintage flavour. Sound quality. Ingenious mounting/shockmounting method. Very low self-noise. JZ Microphones was established in Latvia in 2007, producing microphones designed by Juris Zarins. Their most well-known design to date has been the Black Hole - a multi-pattern condenser mic remarkable for its unique mounting system which clamps into a rectangular hole in the mic's body. An unusual mounting style is also a feature of the JZ Vintage 47, the first mic in the company's Vintage series, which also includes the recently-launched Vintage 67 and the forthcoming Vintage 12. 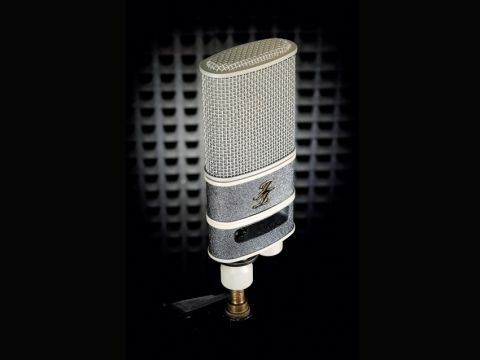 The more astute of you may have already picked up where JZ is coming from with the use of those numbers - the Vintage series is based on classic mics and the V47 aims to give users the type of sound that they would expect from a vintage Neumann U47 model. Unlike an original U47, the V47 features no valve or transformer, but JZ says that advancements in transistors and circuitry since the middle of the last century when the U47 was new, plus other improvements, like the double diaphragm capsule created with the JZ patented 'Golden Drops' sputtering technology, enable them to achieve the same sonic character. Looking not unlike a large hip flask, the V47 comes in a neat foam-lined wooden case with magnetic fastening. There is no separate suspension cradle as the mounting mechanism is integral to the mic's body. This consists of a swivelling ball and socket joint that allows the mic to be positioned at several shallow angles to the vertical, a knurled ring tightening up the joint once you have set the exact angle. There is no need for further shockmounting as there's a built-in system isolating the whole grille and capsule assembly from the solid section that holds the electronics. So, with no encumbrance from a bulky suspension cradle, close placement is a doddle. The V47 features a cardioid pickup pattern and has no extras in the shape of hi-pass filters or pads. It can handle SPLs up to 134dB and is extremely quiet in operation. In recording a male vocal, the V47 was notable for a very clear, detailed and natural sound. While a lot of mics designed primarily for vocals these days will have a built-in enhanced high frequency response, the V47's frequency plot is more or less flat with just a hint of a rise between 2kHz and 7kHz so it doesn't have that extra sizzle. What you get is an accurate but not over-hyped top end, plenty of upper mid-range presence and a nice warm bottom end - especially so when up close, as the proximity effect is quite pronounced, which we found useful for a fatter sound when close-miking a small guitar combo. Overall, when used on a variety of sound sources, the V47 accurately reproduced what we were hearing in the room. As for the U47 comparison, even though vintage U47s can differ sonically due to their condition, there is a perceptible U47 sound and the V47 has a similar character. However, it really should be judged in its own right and, on that basis, it is a very fine microphone indeed.